The Collectif Vintage 'Talis' pinafore top in green is influenced by 1950s style and features a cute U-shape neck and shaped hem that fastens with the three buttons at the waistband to the matching Collectif 'Talis' 50s style Pencil Skirt. Perfectly pretty for pairing with a parasol and parading along the promenade, perhaps with an aperitif! Silver Screen and 50s Pin Up style with neat contemporary Indie kick - The 'Talis' Retro pinafore top from Collectif. - Collectif 'Talis' vintage 50s plain pinafore top in green. - Elasticated panels to sides. - Three button fastening to back. - Button detail to waist to affix pinafore to matching 'Talis' pencil skirt. - SKU: VSS170406C TALIS PINAFORE PLAIN TOP. Composition: Fabric: 97% Cotton 3% Spandex. Approximate Total Length (size 12): 16 1/4 inches (not including button section). The Collectif 'Talis' Vintage 1950s style pencil skirt is influenced by mid 20th century fashion, 1950s Silver Screen glamour and partying in Palm Springs in Hollywood's golden age. Crafted from a linen effect Retro textured fabric and featuring back vent for ease of movement. The cute Retro button details add a stylish touch and also serve a practical purpose - You can attach the matching Collectif 'Talis' pinafore top to create the ultimate Vintage 50s Pin Up look! - Collectif 'Talis' vintage 1950s style pencil skirt. - Three button detailing add a cool retro edge, but can be used to attach 'Talis' Pinafore top too! - Back vent for ease of movement. 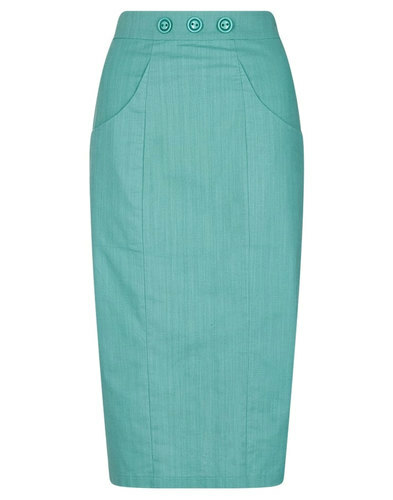 - SKU: VSS170303B Talis Pencil Skirt. Approximate Total Length (size 12): 28 1/2 inches. Collectif Vintage 'Tura' women's Retro 1950s style swallow print blouse. This floaty, summery Vintage crepe fabric top features a flight of swallows on classic cream ground. Shiny metallic Retro dome buttons to the shirt placket and an elegant pussycat bow detail add an elegant touch to the neckline. 1950s style puff sleeves finish the garment off in style. A sophisticated Vintage 1950s lightweight shirt style that goes equally great with skirts or trousers. 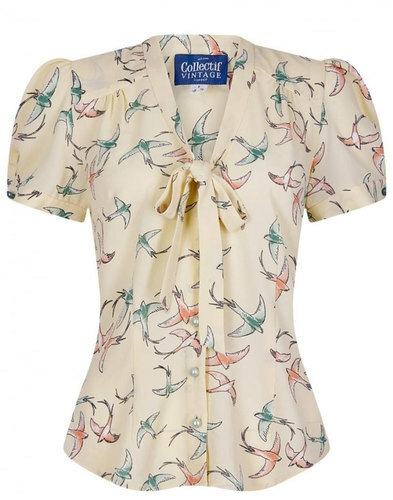 The Collectif Vintage 'Tura' swallow print blouse is perfect for adding a flourish of Retro refinement to your summer wardrobe! - Collectif Vintage 'Tura' retro 1950s swallow print pussycat bow shirt. - Vintage 50s style puff sleeves. - Pussycat bow to V-neckline. - Shiny green metallic look buttons. - Flattering shoulder yokes on back and front. - SKU: VSS170407B Tura Swallows Blouse.